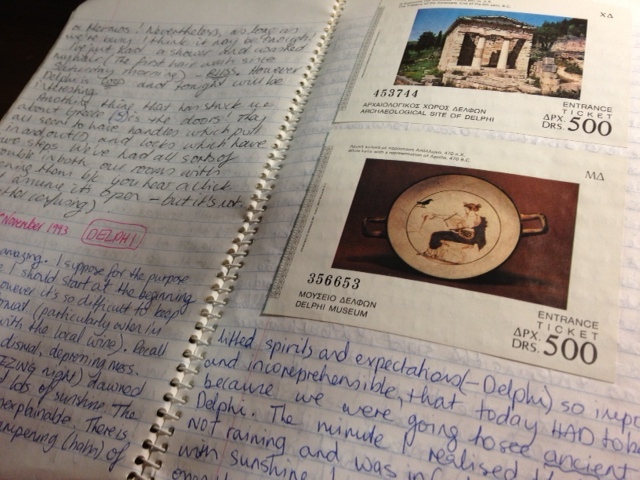 To resume my Travelling in the 90s series (in which I share extracts from my original travel journal with minimal editing to marvel at how different things were back then), we now head to the ancient Greek town of Delphi. 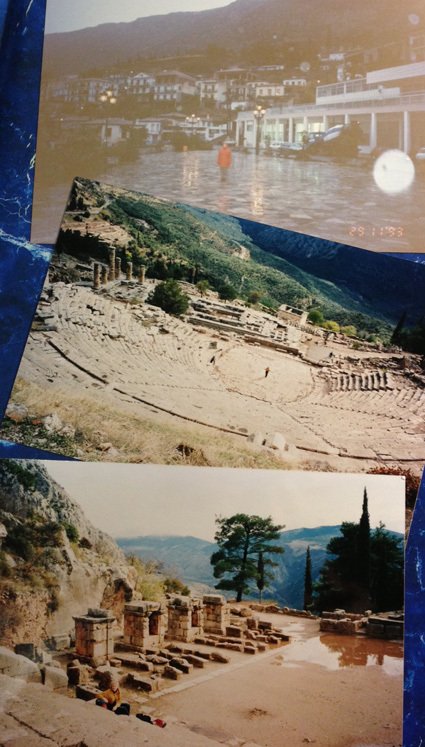 [Mon 29 November, 1993] You’d think that Delphi would know that I was coming and therefore present a beautiful clear winter’s day. No such luck. It’s pouring with rain and has done all day. Nothing is inspiring when it drizzles all day. We arrived in Delphi (on the bus) just after 1:30pm and walked up to the tourist office where we picked up a map of Delphi and were told the hotels we should check out. We went to one called Pension Odysseus and have a clean, neat two-bed room with no heat — but it does have a view!! (I rather expect that anywhere in Delphi would have a view.) After we settled in we trudged down to a taverna which the guide book recommended (and there are many — in fact Delphi seems to consist entirely of hotels (34), restaurants and tavernas, and gift shops) and had a lovely lunch of spaghetti bolognaise at about 3:00pm. Then we wandered around Delphi until about 5:30pm. We decided not to visit ancient Delphi yet because we thought we’d like a whole day, and I’m praying that it’s not raining tomorrow! I’ve been looking forward to my picnic in Delphi for so long now that it’s not allowed to rain — and we even smuggled some wine off the plane for the occasion! Anyway our wander in the rain was quite enjoyable — although it’s slightly depressing at how run-down everything is. Some parts of the town are quite charming though, with new paving, refurbished street lights etc. Most of the tavernas advertise “coffee, toast, ouzo etc” or combinations. [Tues 30 November, 1993] Today has been amazing. I suppose for the purpose of making sense I should start at the beginning and progress, however it’s so difficult to keep to such a rigid format (particularly when I’m three parts sozzled with the local wine). Recall that yesterday was a dismal, depressing mess. Well today (after a FREEZING night) dawned with clear blue skies and lots of sunshine. The relief I was feeling is unexplainable. There is something that makes the dampening (ha ha) of lifted spirits and expectation (ie. Delphi) so impossible and incomprehensible, that today HAD to be nice because we were going to see ancient Delphi. The minute I realised that it was NOT raining and was in fact simply BEAMING with sunshine I was up and out of bed, thrusting open the shutters covering the doors to our little balcony, and simply singing for joy. The time was 8:00am and the day’s photofest started about then. We had breakfast in a little cafe we’d spotted on our walk yesterday — coffee, juice, toast and cake! Following breakfast we purchased some tzatziki for lunch and strode off down the road towards ancient Delphi, very soon stripping off layers because of the sun. Delphi is magic. The sight of those ancient pillars reaching for the blue sky, backed by either rocky mountains or a deep blue-green valley (depending on perspective) really made me want to sing. Unfortunately, according to the signs at the front, singing was prohibited! (As was entering the site in a bathing suit.) DAMN! After the theatre we wandered up to the stadium, and stayed there for ages. Eventually we thought perhaps we’d go see the other ruins, and looked properly at the Temple of Apollo and then the Temple of Athena, the Tholos, and the gymnasium which were further down the mountain. It was all amazing. Unfortunately, our room is rather cold. There is no heater (at least there is, but it doesn’t work). So at the end of the day we sought out another cafe for some coffee. Following this, we had a post-card writing session and then went to a taverna which a local had recommended for dinner. The proprietor was lovely and spoke excellent English (having lived in New York) and was very helpful. We sat at a table closest to the heater and drank home-made wine (at least, I drank most of it). Back in our room now, I have pulled out my sleeping bag. At tavernas you are served bread or water or both regardless of whether you order it. Ditto for OJ with breakfast. All the houses in Delphi have rocks placed on their roofs to prevent the tiles from being blown/washed off. To this day, Delphi remains one of my travel highlights and I would love to visit it again. Once upon a time you could wander around the ancient ruins whenever you liked for free — we weren’t lucky enough to experience this, although I suspect the crowds now, 20 years later, would be substantially more intrusive. We didn’t see too many people on that memorable day. Has a place ever captured your imagination so thoroughly that you’ve planned a holiday around it? Have you been to Delphi? I’d love to hear some shared experiences. I can definitely believe that Delphi must be a very magical place to visit! It is quite shocking to think how tourism has changed and how crowded most of these stunning sights have become! Thanks for commenting and following the blog! I love the idea of posting travel memories from a few years back, thank you. I am in Myanmar now, largely because I had the idea that tourism and the country haven’t figured each other out yet. That is true to some extent (and changing unbelievably quickly) but there is already a backpacker loop. I look forward to reading more of your recollections. Wow – Myanmar would be fascinating to visit. Sounds like a wonderful trip — travelling before the tourists find a place so often is. I haven’t done enough of that really adventurous travel. 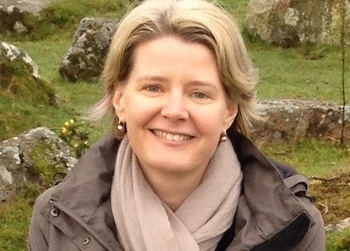 Thanks for visiting and leaving a comment — I hope you do come back for later posts. It’s lovely to have you drop in. You were quite the travel journalist back then. Your journal notes are so thorough and eloquent. Delphi sounds incredible. Must go someday. Thanks, I’m glad you think so. It doesn’t seem so to me at all! I keep wanting to change word selection, describe things more eloquently… And there’s plenty left out all together! It’s REALLY hard not to do more than the lightest of edits to accommodate the parts I’m cutting out. But that would defeat the purpose. I’m finding it fascinating to explore my young ‘raw’ writing style.